Nicola tries many means of finding a man. This leads to some laugh out loud encounters that I could imagine must be based on real life. A carpentry class, a date with a famous actor who she hates, a freezing kayak in a borrowed wet suit and a chance meeting with a Ferret Breeding, lute playing guy, are just some of the moments the reader can cringe along with Nicola. This is such a funny book. I have read a lot of Chick Lit recently, but this is by far my favourite . I'm not the age demographic for this novel (I'm 41) but I could still picture the dire dates that I would have to go on, had I not met my soulmate 20 years ago. 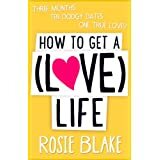 This book is a great bit of fun and thank God Novelicious gave Rosie the chance to get this published. Can't wait to read the next one, Rosie!